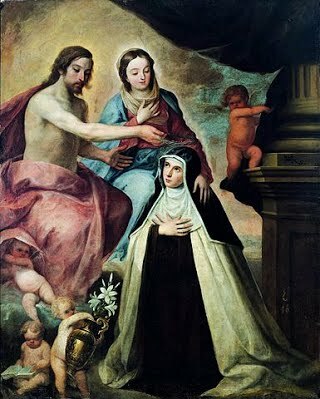 May 25 - Saint Mary Magdalene de Pazzi, Virgin - Optional Memorial - My Catholic Life! ST. MARY MAGDALEN OF PAZZI, of an illustrious house in Florence, was born in the year 1566, and baptized by the name of Catherine. She received her first Communion at ten years of age, and made a vow of virginity at twelve. She took great pleasure in carefully teaching the Christian doctrine to the ignorant. Her father, not knowing her vow, wished to give her in marriage, but she persuaded him to allow her to become a religious. It was more difficult to obtain her mother’s consent; but at last she gained it, and she was professed, being then eighteen years of age, in the Carmelite monastery of Santa Maria degli Angeli in Florence, May 17, 1584. She changed her name Catherine into that of Mary Magdalen on becoming a nun, and took as her motto, “To suffer or die; ” and her life henceforth was a life of penance for sins not her own, and of love of Our Lord, Who tried her in ways fearful and strange. She was obedient, observant of the rule, humble and mortified, and had a great reverence for the religious life. She loved poverty and suffering, and hungered after Communion. The day of Communion she called the day of love. The charity that burned in her heart led her in her youth to choose the house of the Carmelites, because the religious therein communicated every day. She rejoiced to see others communicate, even when she was not allowed to do so herself; and her love for her sisters grew when she saw them receive Our Lord. God raised her to high states of prayer, and gave her rare gifts, enabling her to read the thoughts of her novices, and filling her with wisdom to direct them aright. She was twice chosen mistress of novices, and then made superioress, when God took her to Himself, May 25, 1607. Her body is incorrupt.